Jenni Kayne’s latest campaign is having a huge impact on her business. How? The power of the breast! 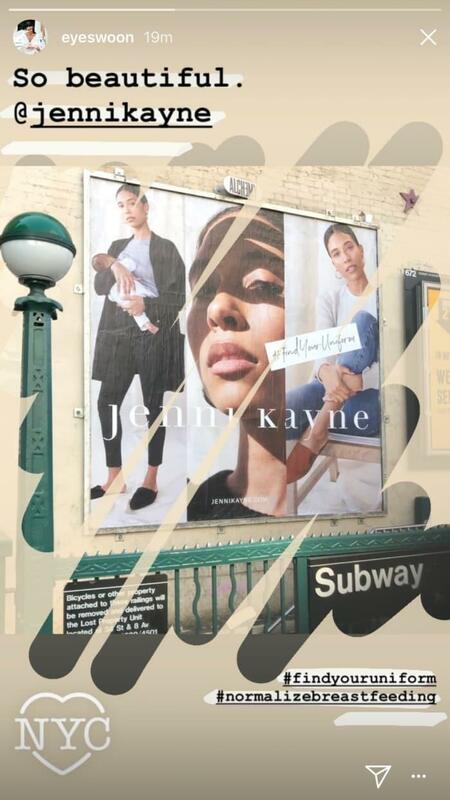 In the ad, model mommy Tylynn Nguyen is seen breastfeeding her newborn son while wearing pieces from Jenni Kayne‘s new “Find Your Uniform” capsule collection. The image went viral almost as soon as it was posted earlier this month, helped by an outpouring of celebrity support from the likes of Kristen Bell, Rebecca Gayheart Dane, Molly Sims, Lauren Bush Lauren, Hannah Bronfman, Athena Calderone, Cristina Ehrlich who all posted the ad on their social media. According to the brand, user-generated content around the ad (people sharing it on social media) means it has been seen by more than 4 million people since it debuted. In addition, sales across Kayne’s various retailers (both online and brick-and-mortar) have more than tripled since the campaign’s launch, compared to this time last year. The breastfeeding image in Kayne’s campaign wasn’t just a marketing ploy, though. The designer is also a big breastfeeding advocate. In an interview on her website, the designer spoke about her own experience. “I think breastfeeding is the biggest gift you can give to your child — and to yourself — if you can make it work. Breastfeeding gives your child the best nutrients and antibodies to protect their health, not to mention the benefits to your body post-labor. When you breastfeed, the oxytocin released in your body bonds you to your baby and helps your uterus contract and return to its size quickly — at about six weeks postpartum, compared to 10 weeks if you don’t breastfeed,” she said. “However, if breastfeeding is not working after you’ve given it a shot, listen to your intuition. Don’t be too hard on yourself. One thing I’ve learned from being a parent is that we can’t control everything,” she added. What’s New In the Hamptons This Summer?